Deployment Manager 4.1.1 includes built-in support for running tests and enforcing quality metrics such as test coverage that you can use to validate every update that is made to your application. These new tasks allow you to model a DevOps pipeline for your Pega application to ensure that changes that your developers make to the application run through all the necessary regression tests and pass your quality criteria, such as guardrail compliance score and test coverage percentage. If any of the quality criteria are not met, the pipeline will fail. You can work with the developers to improve guardrail compliance, test coverage, failing regression tests, or other issues that need to be addressed before deploying to higher environments. These tasks ensure that only high quality and verified application changes are migrated into critical production environments. Use the check guardrail compliance task to verify that your application’s guardrail score meets the threshold that is set for this application. The default value is set to the recommended score of 90. 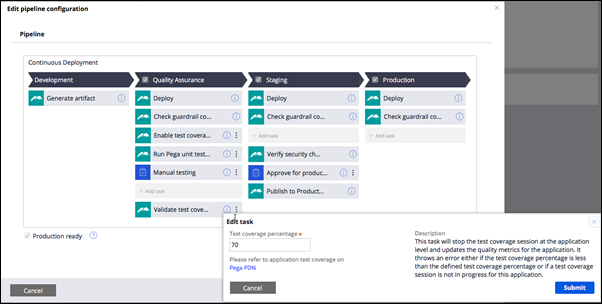 Use the Enable test coverage task to start test coverage, and then collect the coverage metrics for all the tasks that run before the Validate test coverage task. The default value is set to 70% coverage. Use the Run Pega unit tests task to run your Pega unit tests in the pipeline. All the Pega unit tests must pass for this quality gate to pass. 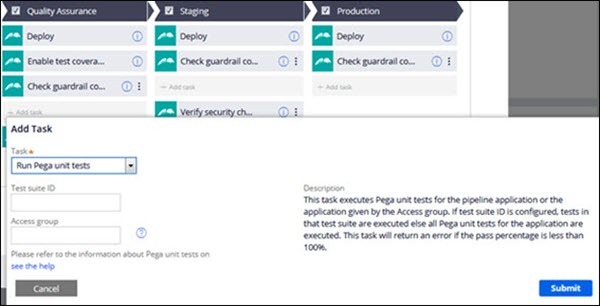 Use the Run Pega scenario tests task to run your scenario tests in the pipeline. You can run these scenario tests by using test service providers such as CrossBrowserTesting, Sauce Labs, Browser Stack, or your own stand-alone Selenium Grid service. All the scenario tests must pass for this quality gate to pass. Use the Verify security checklist task to ensure that your pipeline complies with security best practices. This task is automatically added to the stage before production when you create a pipeline. For more information, see Using Deployment Manager 4.1.x.